Status: Retired Operational Area Search (July 2013). Non-SAR trick: Guarding the backyard against squirrels! Notes: Sirius was named after the Harry Potter character: Sirius Black. SIRIUS UPDATE (04/27/2011):: Sirius deployed to Peru on his first trip overseas. SIRIUS UPDATE (12-29-10):: As 2010 comes to an end, Sirius has had a great year. He turned 3 just recently and has really come into his own. Beginning this last October he has started his tests to become operational. He has already passed his agility, obedience, Open Field, Trail, and Light Brush assessments. He has three more remaining and we hope to be done with them by this Spring (Night, Dense Brush, 160 acre Long Multiple). He also did nine demonstrations for either Cub Scouts, elementary schools, summer camps, dog clubs, and a fire station open house. SIRIUS UPDATE (4-21-10):: I am looking back at the update exactly a year ago today, and thinking not much has changed. Sirius just did a demonstration for the Hybla Valley ES in Alexandria along with another VSRDA dog where he got to meet 150 students. We are also scheduled to attend this years National Association for Search and Rescue (NASAR) conference in Missississippi this May. It will be Sirius's first plane ride. 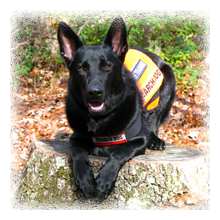 The delay in his progression is due to the fact that over the last six months, Sirius was also training with the Virginia Task Force 1 FEMA team here in Fairfax County (the team that went to Haiti recently) in hopes of also joining that team. However it was determined that Sirius loves the wilderness search and rescue a lot more than urban. Dirt, trails, creeks and woods are more to his liking than cement, steel, beams, and rubble. So we're back to pursuing wilderness full speed and will also be doing water recovery training. SIRIUS UPDATE (10-13-09):: It has been awhile since there has been an update, but that is not for a lack of stuff going on with Sirius! He recently did several demonstrations for some Summer Camps in Fairfax County and at the Prince William County Animal Shelter Open House. He also attended his first long search and rescue training conference, the annual American Rescue Dog Association training weekend held in Maryland. SIRIUS UPDATE (4-21-09):: Sirius had a busy month! He did a Boy Scout Troop demonstration where he got to meet lots of young scouts and demonstrated his recall/refind and commands. He also spent his first time at a kennel being boarded for a weekend while I was out of town. He was very pampered. I left him with his dog pillow and bed and also some toys. When I came back to pick him up, they said he was a very good dog, but would keep dragging all his stuff out through the doggie door into the outdoor part of his kennel! He was VERY tired when he was picked up...I doubt he got much sleep while I was away. In addition to this, we got to squeeze in some good trainings and made his run-aways more advanced with the person running well out of sight of him causing him to rely on his nose that much more. SIRIUS UPDATE (2-21-09):: Sirius has had a busy time these last two months. On a medical front, he was diagnosed with having EPI (Exocrine Pancreatic Insufficiency), a condition where his body can not digest his food, resulting in severe weight loss. Thankfully the condition was diagnosed early, and he has gained back the weight that he had lost after being prescribed a special enzyme that he will be on for the rest of his life. The good news is that this condition will not hamper his training as a SAR dog. Which leads to the second bit of news. Sirius recently trained on his first agility equipment and rubble pile (made up of heaps of wooden pallets), and did a fantastic job for his first time being exposed to such things. This was a result of putting a strong foundation on him prior to official training. Having dogs experience different environments, sights, smells, and conditions builds confidence to overcome anything new that will be introduced. 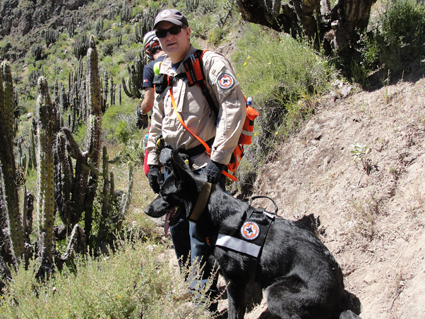 Exposing the dogs, especially while young, to different people and environments is critical in training a SAR dog. SIRIUS UPDATE: In his first year of life, he has already been exposed to many environments and has most recently been on his first boat ride and just learned how to swim. He continues to grow like a weed, and has already outgrown his first SAR vest! He enjoys the wooded areas with no one around, but also the crowds of D.C. or Old Town, Alexandria. In addition to knowing basic commands such as "sit", "down", and "stay", he also now knows how to do short run-away searches with his indication that he's found someone. He has been on vacation to Ocracoke Island and recently scrambled on the rocks of Great Falls. Some people think he's a black Lab with pointy ears!